For other uses, see How to Save a Life (disambiguation). (2007) "Over My Head (Cable Car)"
"How to Save a Life" is a song by American pop rock band The Fray. It was released as the second single from their debut studio album of the same name. The song is one of the band's most popular airplay songs and peaked in the top 3 of the Billboard Hot 100 chart in the United States. It became the joint seventh longest charting single on the Billboard Hot 100, tying with Santana's "Smooth" (1999), at 58 consecutive weeks. The song has been certified 3x Platinum by the RIAA, and has sold 4.7 million downloads as of January 2015, the fourth best-selling rock song in digital history. It is the band's highest-charting song to date, topping the Adult Top 40 chart for 15 consecutive weeks and topping the Canadian Airplay Chart. It was also nominated for a Grammy Award for Best Rock Performance by a Duo or Group with Vocal in 2007, but lost to "Dani California" by Red Hot Chili Peppers. The song is the band's first to achieve significant popularity outside of the United States. "How to Save a Life" was a top five hit in Australia, Canada, Ireland, Italy, Spain, Sweden and the United Kingdom. Due to an early leak by BBC Radio 1 in the United Kingdom, where it was the band's debut single, the song was released in the territory five weeks earlier than planned. It debuted at number twenty nine on the UK Singles Chart on January 21, 2007 via downloads alone. Instead of its planned release date which was to be March 26, 2007, the single was physically released in the United Kingdom on February 28 and gradually rose up the chart, reaching number five on February 25, staying there for four weeks. It eventually peaked at number four on the UK Singles Chart on April 8 and became Britain's eleventh biggest-selling song of 2007. On March 29, "How to Save a Life" peaked at number 1 in Ireland, becoming their first and only number one single in the country to date. The song only stayed at the top spot for a week but sales still proved strong after it fell from number 1. The song was ranked No. 24 on Billboard's Best Adult Pop Songs of the Decade, and No. 47 on Billboard's Top 100 Digital Tracks of the Decade. It was also ranked No. 58 on Billboard's Hot 100 Songs of the Decade and No. 56 on Rhapsody's list of the Top 100 Tracks of the Decade. The song was the 25th most downloaded song of all time on iTunes as of February 2010. The song has sold over 4.7 million copies in the US as of January 2015. The song was first featured on ABC's Grey's Anatomy, after Alexandra Patsavas, the music supervisor for the show, saw the band perform in Los Angeles. Alexandra then incorporated the song into "Superstition", an episode of the show's second season (first aired on March 19, 2006). After its usage in the episode, the song became a minor Hot 100 hit. The song became an "unofficial theme" for the other members of the Grey's Anatomy production after the episode aired, leading to the decision that the song would be used in the main promotion for the third season in the show. Grey's Anatomy is credited with bringing popularity to the song. The song also featured prominently in the season five Scrubs episode "My Lunch" on April 25, 2006, and was used as the song of choice for the 'best bits' of the eighth series of Big Brother UK. . The original music video, which premiered on VH1 on 12 September 2006, featured the recurring themes of light and stopped time. This music video shows the scene of a car crash and all of its presumed victims in pause. There is a recurring light throughout the video shining brightly in the dark woods that the video takes place in. Scenes of the band playing in a dark warehouse are intercut with the story going on outside. This version of the video was placed at No. 21 of the year by VH1's "Top 40 Videos of 2006". Another version of the music video juxtaposes scenes from Grey's Anatomy to scenes of the original music video. However, all the scenes of the presumed car crash victims are excluded and only scenes of The Fray playing in a warehouse are shown. A third music video, directed by Mark Pellington, was released for the song on 6 December 2006. The video features various adolescents, most of which seem to be between 12–18 in age, all who appear to be depressed and suicidal, or possibly mourning the loss of a loved one. All of these children have lost a significant loved one prior to the video, and many of them cry and scream in the video, all against a white background. Scenes of the band playing the song against this same white background are also shown throughout the video. Many numbered steps are shown alongside them, such as "Remember", "Cry", or "Let It Go". The video ends with each child finding a catharsis and making peace with themselves or others. This version of the video debuted on MTV's Total Request Live (TRL) at No. 9, and went on to top the countdown at No. 1 on 21 December 2006, becoming the band's first TRL No. 1, and also becoming the last No. 1 video on TRL for 2006. ^ Inc, Nielsen Business Media (14 October 2006). "Billboard". Nielsen Business Media, Inc. – via Google Books. ^ "Recording Industry Association of America". RIAA. Archived from the original on 2015-03-29. Retrieved 2012-02-22. ^ a b Polk, Christopher (January 31, 2015). "The 15 Most Downloaded Songs in Rock History". Yahoo! Music. Retrieved February 5, 2015. ^ Gardner, Elysa (July 12, 2006). "Debut 'How to Save a Life' takes on a life of its own". USA Today. Retrieved May 4, 2010. ^ "Diving Into – The Fray" (PDF). Sauce. June 9, 2006. Archived from the original (PDF) on 2011-02-18. ^ "Best of the 2000s: Adult Pop Songs". Billboard. Archived from the original on January 27, 2010. ^ "Best of the 2000s: Digital Songs". Billboard. Archived from the original on January 27, 2010. ^ "Best of the 2000s: Hot 100 Songs". Billboard. Archived from the original on 2009-12-21. ^ Editorial, Rhapsody (2009-12-09). "Top 100 Tracks of the Decade – Rhapsody: The Mix". Blog.rhapsody.com. Archived from the original on 2012-02-20. Retrieved 2012-02-22. ^ Herrera, Dave (2010-02-25). "The Fray, Frank E and Ryan Tedder make list of Top 25 iTunes downloads – Denver Music – Backbeat". Blogs.westword.com. Retrieved 2012-02-22. ^ "Top 10 Rock songs downloaded (Of all time)". i99radio.com. Archived from the original on 2015-02-20. ^ "How 'Grey's' got that catchy new "theme" song". New York Post. 24 September 2006. Archived from the original on May 12, 2007. ^ "Scrubs - Music". www.scrubs-tv.com. Retrieved 2019-02-13. ^ "The Fray - How To Save A Life". Discogs. ^ "Australian-charts.com – The Fray – How To Save A Life". ARIA Top 50 Singles. Retrieved July 7, 2012. ^ "Austriancharts.at – The Fray – How To Save A Life" (in German). Ö3 Austria Top 40. Retrieved July 7, 2012. ^ "Ultratop.be – The Fray – How To Save A Life" (in Dutch). Ultratop 50. Retrieved July 7, 2012. ^ "Ultratop.be – The Fray – How To Save A Life" (in French). Ultratip. Retrieved July 7, 2012. ^ "The Fray Chart History (Canadian Hot 100)". Billboard. Retrieved July 7, 2012. ^ "Lescharts.com – The Fray – How To Save A Life" (in French). Les classement single. Retrieved July 7, 2012. ^ "Offiziellecharts.de – The Fray – How To Save A Life". GfK Entertainment Charts. Retrieved July 7, 2012. ^ "Chart Track: Week 13, 2007". Irish Singles Chart. Retrieved July 7, 2012. ^ "Top Digital Download – Classifica settimanale dal 11/05/2007 al 17/05/2007" (in Italian). Federation of the Italian Music Industry. Archived from the original on February 23, 2014. Retrieved July 7, 2012. ^ "Classifica Mix e Singoli – Classifica settimanale dal 24/08/2007 al 30/08/2007" (in Italian). Federation of the Italian Music Industry. Archived from the original on September 10, 2007. Retrieved July 7, 2012. ^ "Nederlandse Top 40 – The Fray" (in Dutch). Dutch Top 40. Retrieved July 7, 2012. ^ "Charts.nz – The Fray – How To Save A Life". Top 40 Singles. Retrieved July 7, 2012. ^ "Norwegiancharts.com – The Fray – How To Save A Life". VG-lista. Retrieved July 7, 2012. ^ "Portugal Digital Songs – Peak". Billboard. Retrieved 19 May 2013. ^ "Swedishcharts.com – The Fray – How To Save A Life". Singles Top 100. Retrieved July 7, 2012. ^ "Swisscharts.com – The Fray – How To Save A Life". Swiss Singles Chart. Retrieved July 7, 2012. ^ "The Fray Chart History (Hot 100)". Billboard. Retrieved July 7, 2012. ^ "The Fray Chart History (Pop Songs)". Billboard. Retrieved July 7, 2012. ^ "The Fray Chart History (Adult Contemporary)". Billboard. Retrieved July 7, 2012. ^ "The Fray Chart History (Alternative Songs)". Billboard. Retrieved July 7, 2012. ^ "The Fray Chart History (Adult Pop Songs)". Billboard. Retrieved July 7, 2012. ^ "The Fray Chart History (Hot Christian Songs)". Billboard. Retrieved January 13, 2019. ^ "Official Singles Chart Top 100". Official Charts Company. Retrieved 2013-02-11. ^ "Hot 100 Songs: Year End 2006". Billboard. Billboard. Retrieved 13 February 2016. ^ "ARIA Top 100 Singles 2007". ARIA. Archived from the original on 2010-07-31. Retrieved 2012-04-15. ^ "Jaaroverzichten 2007". Ultratop (in Dutch). Ultratop & Hung Medien. Archived from the original on 20 May 2011. Retrieved 13 February 2016. ^ "Best of singles 2007". IRMA. IRMA. Retrieved 13 February 2016. ^ "Top Selling Singles of 2007". NZTop40. Recorded Music New Zealand Limited. Retrieved 13 February 2016. ^ "Årslista Singlar - År 2007". Hitlistan (in Swedish). Grammofon Leverantörernas Förening. Archived from the original on 21 January 2016. Retrieved 13 February 2016. ^ "Official UK Singles Chart of 2007" (PDF). Retrieved 2012-04-15. ^ "Billboard Hot 100 Year-End 2007". Retrieved 2012-04-15. ^ "Decade End Charts – Hot 100 Songs". Billboard. Prometheus Global Media. Archived from the original on October 20, 2012. Retrieved 13 February 2016. ^ "ARIA Charts – Accreditations – 2007 Singles". Australian Recording Industry Association. Retrieved 12 December 2014. ^ "Canadian single certifications – The Fray – How to Save a Life". Music Canada. Retrieved February 6, 2012. ^ "Guld og platin i August" (in Danish). IFPI Denmark. Archived from the original on January 17, 2015. ^ "Italian single certifications – The Fray – How to Save a Life" (in Italian). Federazione Industria Musicale Italiana. Retrieved December 12, 2014. Select "Tutti gli anni" in the "Anno" drop-down menu. Select "How to Save a Life" in the "Filtra" field. Select "Singoli online" under "Sezione". ^ "Latest Gold / Platinum Singles – RadioScope New Zealand". Radioscope.net.nz. Archived from the original on October 14, 2008. Retrieved August 11, 2011. ^ Copsey, Rob (September 19, 2017). "The UK's Official Chart 'millionaires' revealed". Official Charts Company. Retrieved November 2, 2017. 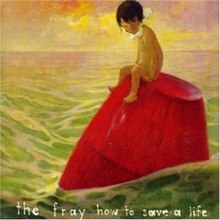 ^ "British single certifications – The Fray – How to Save a Life". British Phonographic Industry. Retrieved December 12, 2014. Select singles in the Format field. Select Platinum in the Certification field. Type How to Save a Life in the "Search BPI Awards" field and then press Enter. ^ "American single certifications – The Fray – How to Save a Life". Recording Industry Association of America. Retrieved October 31, 2009. If necessary, click Advanced, then click Format, then select Single, then click SEARCH. ^ "Certificeringer – The Fray – How To Save a Life" (in Danish). IFPI Denmark. Retrieved October 9, 2014. Full lyrics of this song at MetroLyrics. This page was last edited on 13 April 2019, at 23:47 (UTC).